Bihar Police Sub Inspector SI Admit Card 2018 – Download Call letter for Bihar Daroga Exam: Bihar Police SI (Daroga) Recruitment Notification PDF out. The Bihar Police Sub-ordinate Services Commission (BPSSC) has posted a recruitment notification for the Selection of Police Sub Inspectors in Bihar Police against 1,717 vacant Bihar Daroga posts. Written examination date for Bihar Daroga Exam has been scheduled to be held on 11th march for filling up 1717 Sub Inspector vacancies. Bihar Daroga (Sub inspector SI) 2018 Exam Admit Card to be out. The Bihar Police Sub-ordinate Services Commission (BPSSC) will hold an examination and Psychical Test for Recruitment of Sub-Inspector in Bihar Police. The Bihar Police Sub-ordinate Services Commission (BPSSC) is going to conduct an examination and Psychical Test for the recruitment of Police Sub Inspectors in Bihar Police against 1,717 vacant posts for the year 2017. Written examination will be conducted and Physical Efficiency Test as well for the selection of Sub Inspector (Daroga) in Bihar Police. There will be also 35% Women Reservation for Bihar Daroga Vacancy 2017. Selection Process: Candidates will be selected for the post of Sub Inspectors in Bihar Police on the basis of their performance in Written Examination and Physical Efficiency Test (PET). 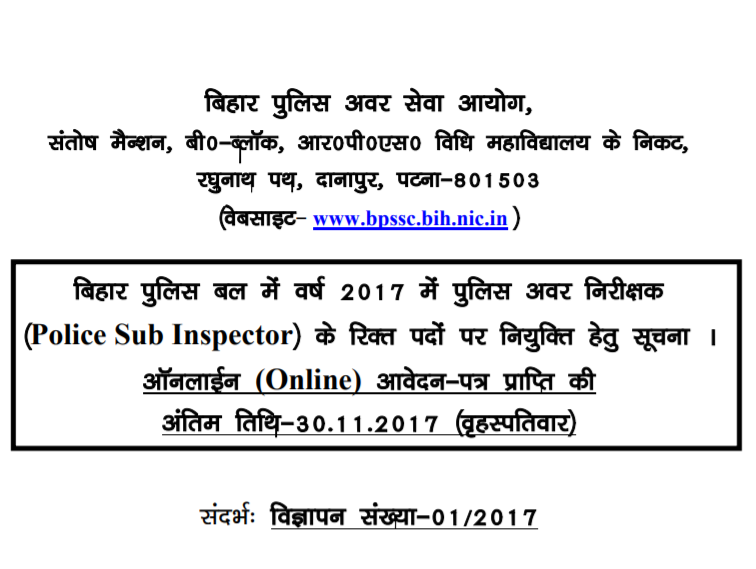 Bihar Police SI Online Application Form: All those candidates who have applied for Bihar Police Daroga for Sub Inspector (SI) Exam through BPSSC, they are now required to download Bihar Daroga Admit Card in at Bihar Police’s official website at bpssc.bih.nic.in in order to appear at Bihar Police Sub Inspector Exam on 11th March 2018. Log on to Bihar Police's official website at bpssc.bih.nic.in. Find the link of Apply Online for Selection of Police Sub Inspectors in Bihar Police. Register for Bihar Daroga Vacancy 2017. Enter required details i.e. Name, Address, Education details etc. Upload Photo & Signature details. Take print out of Bihar Police SI Vacancy. If you are looking for Bihar Police sub-Inspector Admit Card 2018 for more details i.e. Exam Date, Exam Pattern, Exam Center, Written Exam details, Psychical Test details etc. read Bihar Police SI Admit card notification of Bihar SI Vacancy. Bihar Daroga Admit Card is out and it is available for download. Candidates are strongly advised to download Bihar Daroga Admit Card online for Bihar Daroga Sub Inspector (SI) Recruitment.